An instructive guide to creating an illustrated journal based on artist and Instagram sensation Samantha Dion Baker's unique creative process, featuring information on materials, creative inspiration and instruction, prompts, and helpful tips and tricks. Samantha Dion Baker is a widely admired and followed artist on Instagram, where she shares her "sketch journal," an illustrated daily record of her life, drawn in a fresh, modern style. 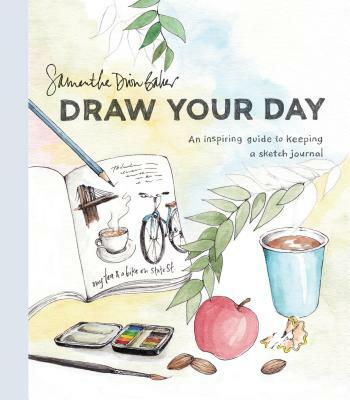 In Draw Your Day, Baker guides you through her inspirational practice and provides guidance for starting your own. Part instructional guide and part encouraging manifesto about how making art--even art that's not museum-worthy--can make your life more mindful and meaningful, Draw Your Day is ideal for both seasoned artists looking for fresh inspiration, as well as aspiring artists who need a friendly nudge to get started. SAMANTHA DION BAKER is an artist and graphic designer known for her detailed illustrations and journal work, published most recently in BuzzFeed and on Instagram and Instagram for Business. She graduated from Cooper Union in New York City and spent more than twenty years as a graphic designer working with many iconic institutions including The Whitney Museum of Art, St. Regis Hotels Resorts, and The Shaker Museum. Her illustration clients include The High Line Hotel, Atelier Cologne, and Kikkerland Design. Her self-published daily sketch journals are on permanent collection at The Morgan Library at The Metropolitan Museum of Art. Originally from Philadelphia, Baker lives in Brooklyn Heights with her husband and two boys.